The downtown skyline will soon be illuminated with the somber Tribute in Lights. Two giant beams of light cutting through the realization that we are upon the 9th anniversary of the terror attacks on the World Trade Center. The Tribute in Light first came on six months after the attacks in 2002, and have been primarily funded by the Lower Manhattan Development Corporation (LMDC) who have provided the financial support of the iconic tribute. 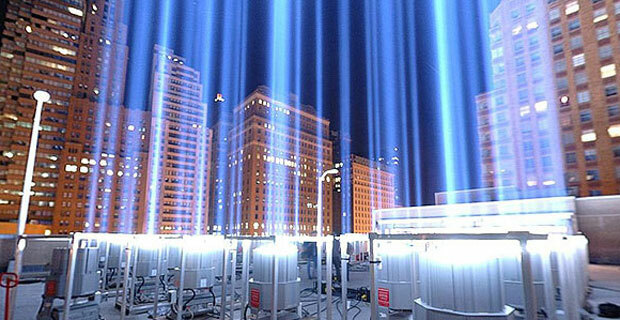 Contrary to popular belief, the Tribute in Lights is not beaming at the World Trade Center site but are located six blocks south of Ground Zero, set atop the Battery Garage on Morris Street. During the first two years of the tribute, the lights were located on West Street where the Goldman Sachs building now stands. The tribute is comprised of 88 4-foot tall searchlights set in 50 x 50 foot identical squares. Although primarily subsidized by the LMDC, the project is also in conjunction with Con Edison. It is speculated that after the LMDC re-allocated funding earmarked for Con Edison, meant to subsidize Con Edison’s costs at the World Trade Center Site may play a role in compromising the future of the Tribute. As of today, it is if the Tribute will exist beyond the 10th anniversary of the World Trade Center attack in 2011. This year, as the past few years, the tribute will begin at dusk on September 11th and end on dawn of September 12.